Have you come across other mighty warriors during your ventures through Sapphire? Have you wondered how powerful you can become if you combined forces? Well the new game mode Team Arena now provides a chance for you and your buddies to fuse your squads into the ultimate fighting force! Can your team create the strongest squad on Sapphire to reach the top? 【Access】 Click on “Team Arena” in X-Server panel. 【Event Time】 Each season starts on 4th of each month and will run for 25 days. Each day, players can battle in Team Arena during 5 periods: 00:01-1:00, 8:00-9:00, 13:00-14:00, 16:00-17:00, 21:00-22:00. 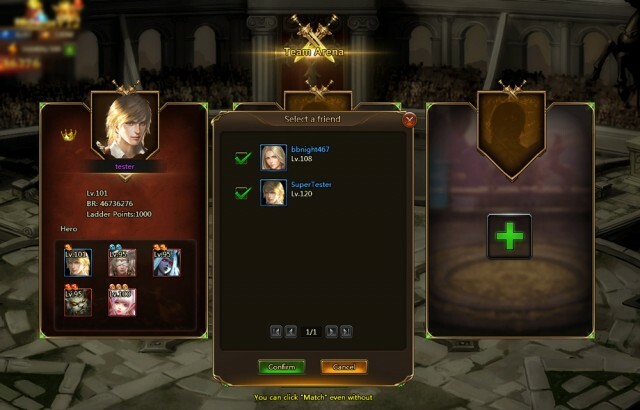 In Team Arena, players can participate solo or as a team. Players can click on “Solo Queue” to be auotmatically matched with other players of similar B.R from any server; click on “Team Queue” to invite your friends from the same server to fight together. 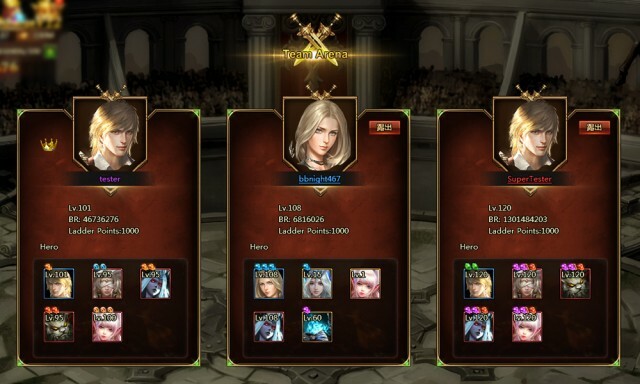 ① Each team member can choose 2 of their Heroes (or Character and Battle Pet) to create a strong squad of 5 Heroes and 1 Battle Pet (only 1 of each Hero allowed). Afterwards the Captain sets formation and the team can start to battle. ② The system will search for opponents based on the team’s average Ladder Points. A battle is won when all the enemy heroes are defeated. ③ Each player can fight 12 times for free each day. Additional attempts can be purchased with Topaz. ① Each player’s Ladder points will be reset to 1000 at the beginning of each season. The amount of points players get from battles will depend on their current points. If the player’s current points are 2500 and below, then each victory will add points but losses will not deduct points; if the player’s points are higher than 2500, then a victory will add points and a loss will deduct points. ② The amount of points added or deduced depends on the Ladder Points of both teams. The stronger the enemy you defeat, the more points you can earn. However, if you lose to an enemy weaker than you, you can lose a lot of points. ① At the end of each battle, players can draw rewards regardless of the battle results. ② For each season, players can get rewards when they reach certain Ladder Point amounts for the first time that season. The top 100 players at the end of a season will earn super rewards! With the arrival of Team Arena, players can now work together like never before to prove that they are the best that Sapphire has to offer. Stay tuned to the League of Angels II Facebook fanpage and official website for more content coming soon! Last：A New Guest Has Arrived in Sapphire!